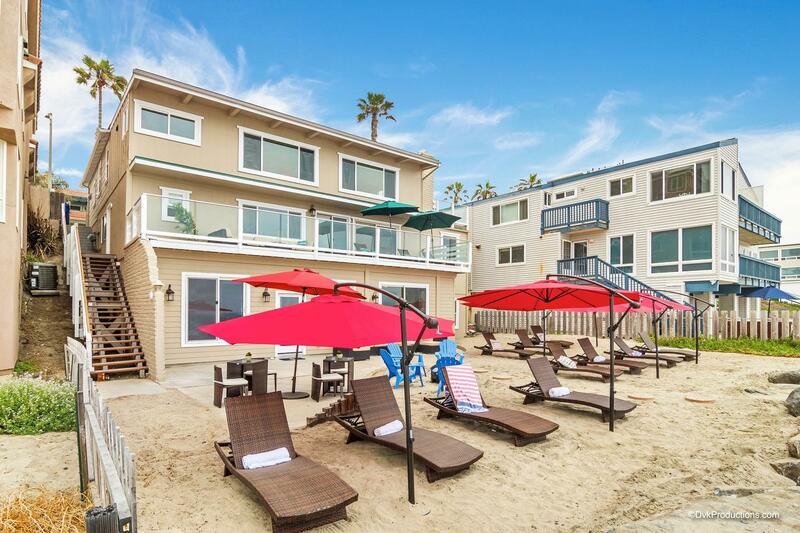 This is an amazing two bedroom unit, in a brand new triplex, which sits directly on the beach. There is a large spacious living room with a fire place to warm up near and media area to gather around in with your family. The kitchen has new granite countertops, in addition to new appliances. 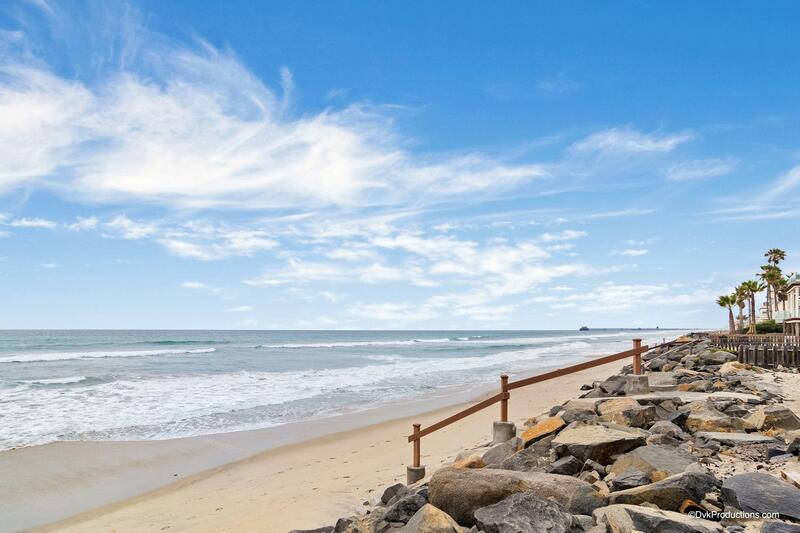 The entire unit overlooks the Pacific Ocean and even provides a pathway onto the beach. 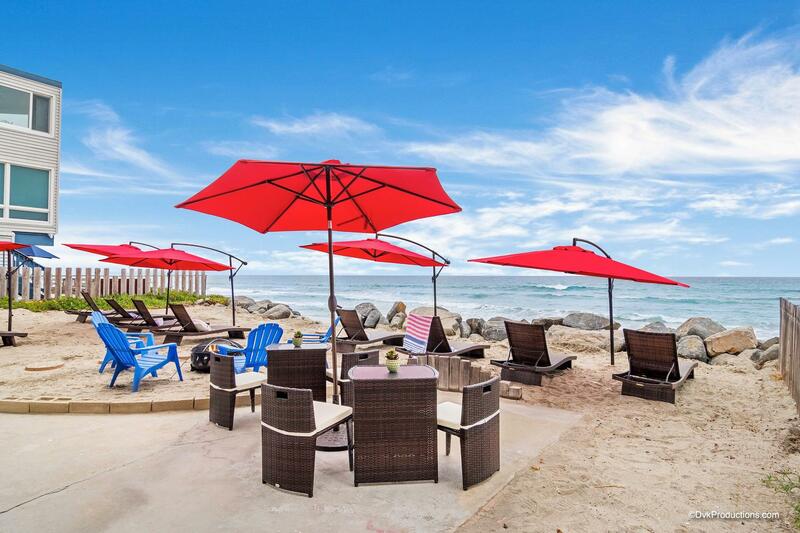 This unit has everything you could possibly need for an amazing beachfront vacation! There is plenty of space for the entire family. 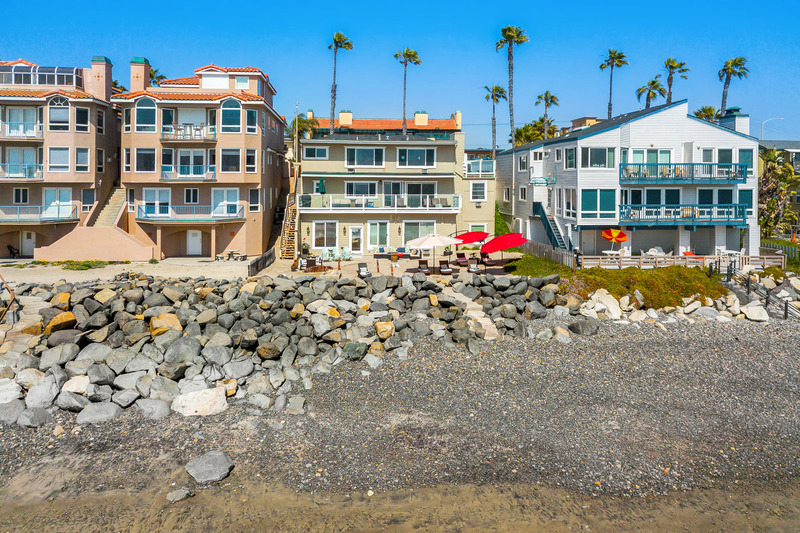 If extra parking is needed, we do offer our guests parking at our office in Oceanside, located at 1640 Oceanside Blvd, Oceanside, CA 92054. 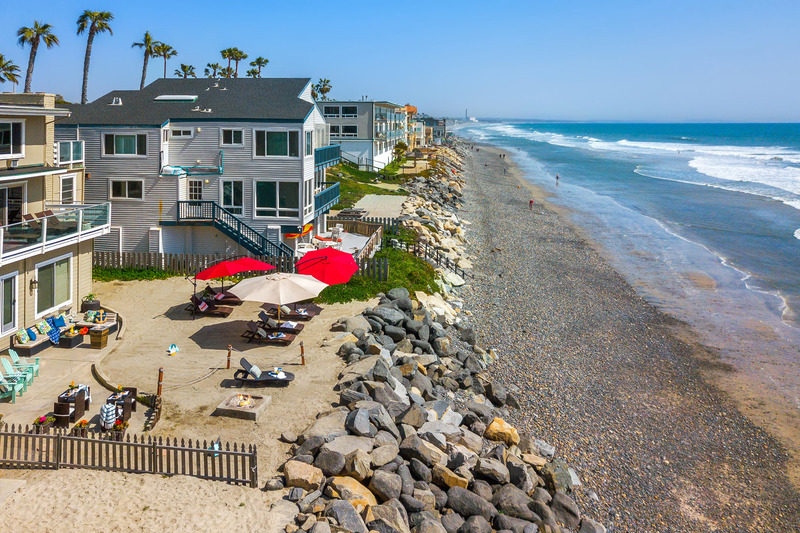 Oceanside offers travelers with tons of activities to participate in. For a full list, be sure to visit our "Things to Do" tab on our website. 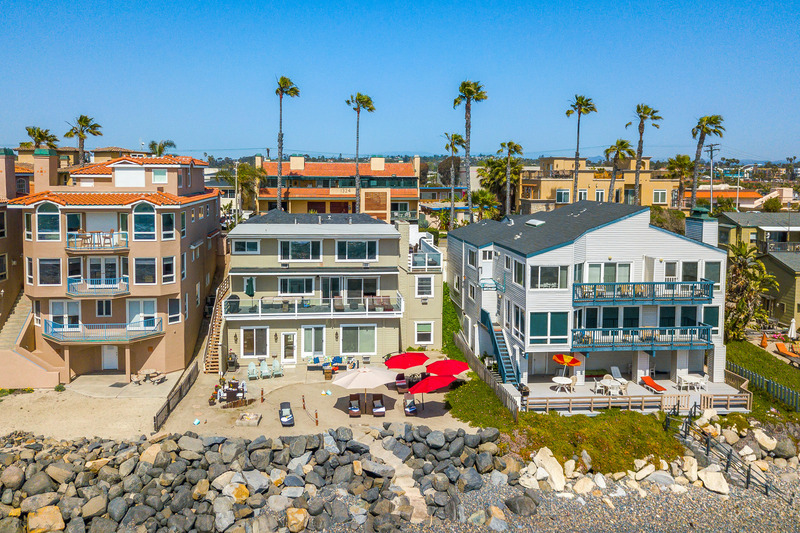 In addition, main tourists destinations like Legoland, the San Diego Zoo Safari Park, and SeaWorld San Diego are all below a 45 minute drive. 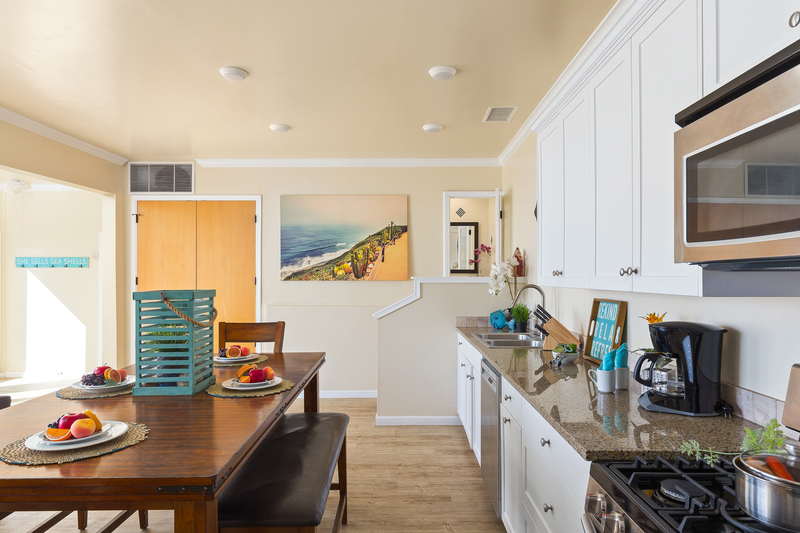 Beach front, 2 bedroom, ocean view kitchen which even made making meals enjoyable. 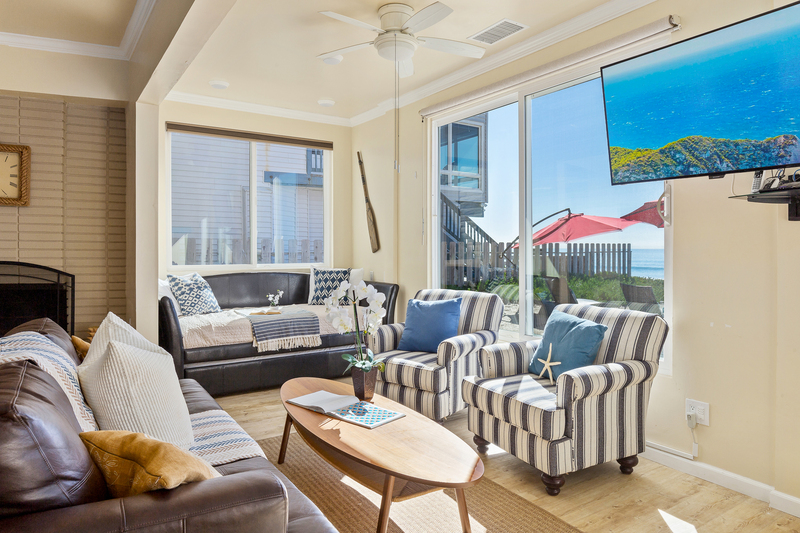 Well equipped for 8+ guests including beach towels, cooking necessities,seating for a family with an ocean view. Our family of four had a great time in this 2 BR condo. Unit was spacious, nicely furnished and had all amenities one would expect. Excellent. This is the 6th time we have used a condo through Beachfront. All our experiences have been outstanding. The condo's and customer service are first rate. We had 2 condo's this trip both were GREAT. We absolutely loved the location and the house. It was very cosy and clean and perfect for a getaway with our small children. The only (minor) thing we missed, was a good coffee machine (it has one, but only filter coffee). A Nespresso machine would be very nice. But, besides this, we can really recommend this place!! We had a great time at this condo and will hope to return in the future. The property was just as described - indoors was clean and well appointed and the outdoor patio was wonderful. The only sort of downer was that the beach was all rocks for most of the day, but there was a bit of time while the tide was out when there was sand. We had an awesome weekend. The location was perfect all you had to do was walk right down the steps and your at the beach. There was a couch that was In the living room that was pretty beat up and one of the a/c units was barely working. There were blinds that were see through in the living room area and in one of the bedrooms. There were guests at the property that would have a camp fire at night and they could see right through our windows- there was no privacy at all and maybe those need to be changed. Also the parking is very limited, we came with a suburban we barely had room to park it, we did get a ticket because it was left out on the night that the sweepers come through. The parking spaces do need to be made bigger for larger vehicles. Everything was wonderful, perfect location, private, spacious and beautiful home. The house was spotless upon arrival, the beds were so comfortable to sleep in and you couldn’t ask for a better view. Even though it’s a triplex, we never once had any issues with our upstairs neighbors, they were another family as well who we would see pass by and say hi but that’s about it. The property mgmt company was on top of it as well with email responses within the hour of us having any questions. Overall my family intends to make this spot an annual summer vacation trip now. Its all worth it. Easy to get in with keypad, clean, fun, beautiful views. So worth your money. Kid friendly. Parking is the only thing. Couldnt fit our vehicle in the spot but street parking was super easy to get. Also listed 3 spots however only saw 2 spots for number 3. Oceanside is a beatiful place. Our beachfront condo was right on the beach and listening to the waves all day was lovely. We had all of the amenities we needed. There were 4 of us. The one bathroom was no problem (it is small and no tub). It would have been nice if the sizes of the beds had been listed. My parents had to sleep on a full size bed as I was with my son and there was only the one room with a king size bed meaning that another couple without kids is a little cramped. We loved the general living space and the outdoor space did not disappoint. It was hot and the claim that there is air conditioning is really inaccurate. Although there was units (that would fit in a window) they were not sufficient to cool the space. The property management was responsive and helpful. Also, I stayed with my elderly parents and I have a bad knee. It would be nice if the stairs to the beach went all the way down to the water. Walking on the rocks was very challenging. My parents were not able to do it and if you wanted to bring a pop up and chairs down to the beach it was a struggle. Had it been cooler we would have been much more comfortable. The views and the location were stunning! The house was clean and exactly as pictured in the website. The beach was great and easily accessible. The staff was responsive and addressed my concerns the next day. I would highly recommend beachfront only rentals. A few things to improve 1) lighting in the stairway going down to the unit 2) A/c was working but not strong enough to keep the kitchen and living room cool 3) we had issues with the other units using the patio exclusive to our unit but the staff did tell them and they eventually followed 4) patking says 3 cars, but more like 3 compact cars or 2 mid sized suvs 5) lights and ac had timers with 4 hrs max so we had to wake up in the middle of the night to turn the ac back on. Quick and helpful management. Clean, beautiful and well-stocked condo. 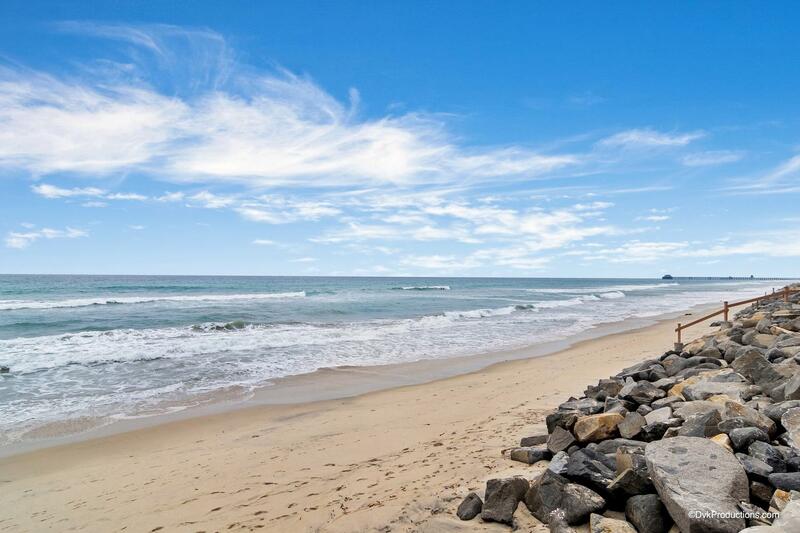 Peaceful and convenient location to the beach and to stores and shops. You can't beat it!! 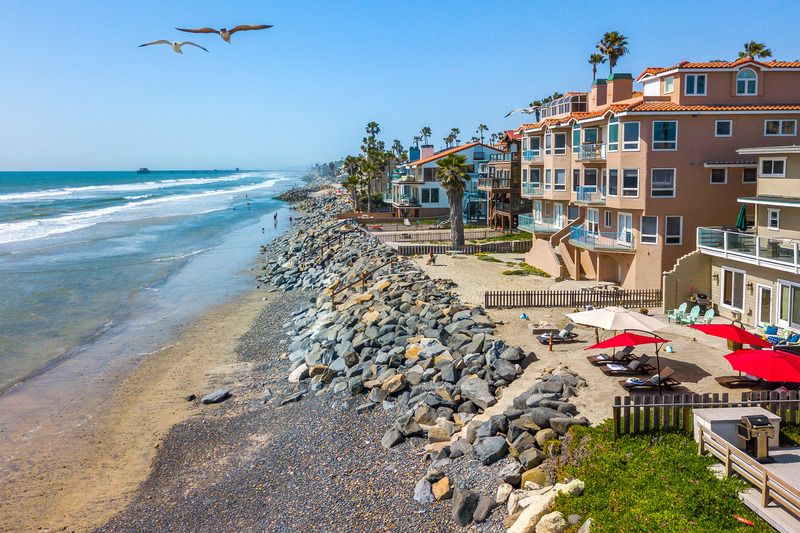 We have vacationed in Oceanside every year for Fall Break for 5 years in a row. 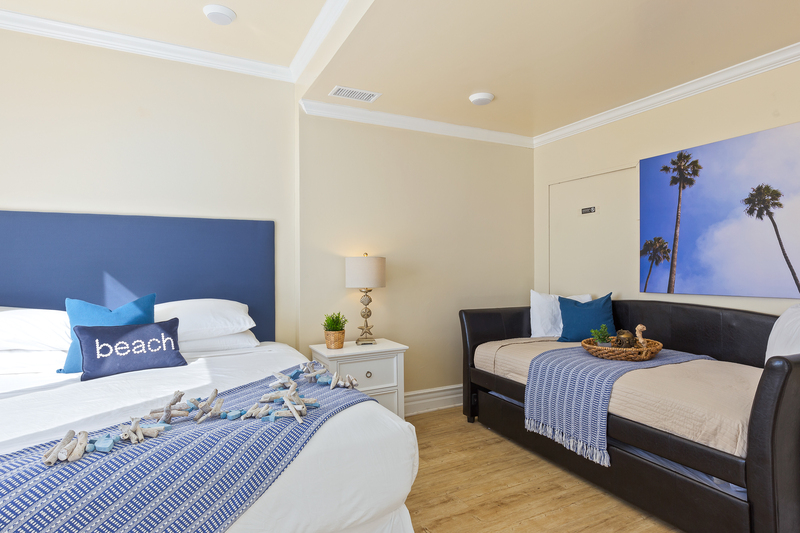 We have booked our beachfront rental with Beachfront Only each time and have never been disappointed. This rental was perfect for our family of 4 plus Grandma and Grandpa. Plenty of room and the view was amazing. 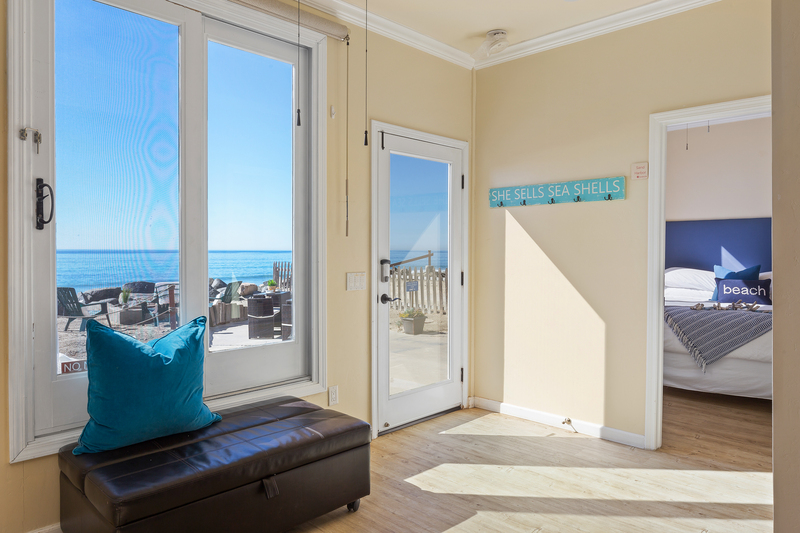 Love that you can open up the doors and windows to feel the breeze and hear the ocean. The kids played on the beach all day every day and we could sit right on the property and watch them. 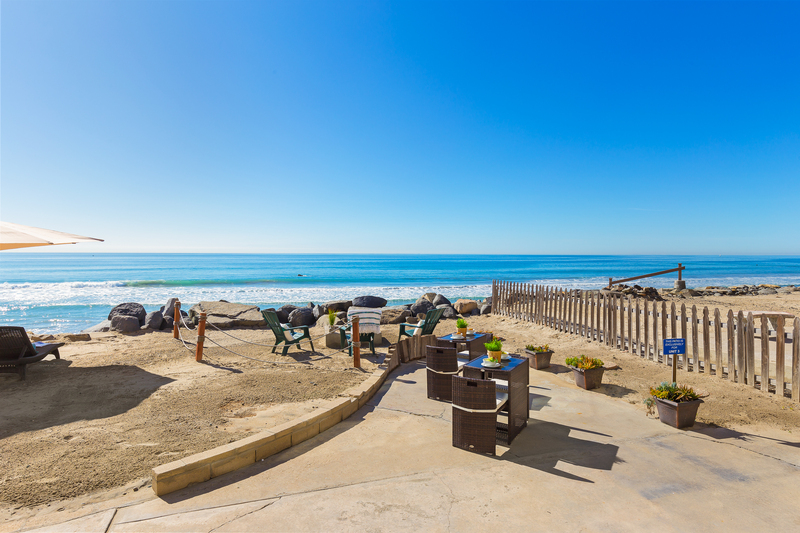 The designated patio and sand area right outside the door is worth the money. However, it can be crowded and overwhelming with both units above you. During our stay there were parties of 15-22 people at a time. Overall, we had a great time and we will be back but will probably try to find a unit with less company above us. The condo was beautiful and clean with all the amenities we needed. Lots of towels, beach towels and even s'more s skewers for the fire pit. The parking was tricky. There are two spaces, but extremely short- we had to park sideways to make our Tahoe fit. The renters on the third and second floors (frat spring break and a fifteenths bday party) were loud, but no fault to the owners. We stayed here for an early spring break vacation! It was a fabulous time! We loved being able to be steps away from the ocean our whole stay. The property was clean, had lots of appliances and a grill! We mostly just grilled and stayed at the beach house each night. The location is also just a mile away from the farmers market that we enjoyed one night. Would definately reccomend this property to anyone, won't disappoint! When we arrived, everything looked great inside the house. Very spacious. There were 10 of us, and there could have been space for more! Tons of appliances available and the outdoor seating was great. Right on the beach and the view was amazing! We did have to street park though, because the spots provided weren't big enough for our cars because of the cones. We enjoyed the beach house, but didn't enjoy having people from upper units hanging out on the patio right outside of our living space. We also would have liked to have restaurants within walking distance. The unit itself was fine, but if we would have had anymore people it wouldn't have worked for us. We loved staying at the beach house. It was very clean, had everything we needed in the kitchen and was perfect location. My 2 toddlers loved being able to walk out the front door and play at the beach while we sat on the patio. We BBQed one night and had a campfire. We had a great stay. We'll definitely be back! The condo was beautiful, clean, and had tons of amenities that aren't even listed on the website. I was surprised to see it had a dishwasher and a washer and dryer. Everything you could possibly need was there. It was so peaceful and private and the beach is just below the condo. Plenty of beach space during the day. Amazing falling asleep to the sound of the waves right outside our windows. Loved our stay. when we got there it was beautiful we never stayed at the beach before to sum it up the kids and us adults did not want to leave. Great location. Plenty of room for small family (we are a family of 5.) During our stay, we encountered a small issue with our patio umbrellas. Management sent someone out to take a look and the broken umbrellas were replaced in no time. Overall, this place exceeded our expectations. Can't wait to be back. We are already looking at dates for our next getaway! You know how places are never as good as the picture? Not this time! This was the absolute BEST location possible. We had made-to-order weather to boot. House was perfectly laid out for a family gathering. 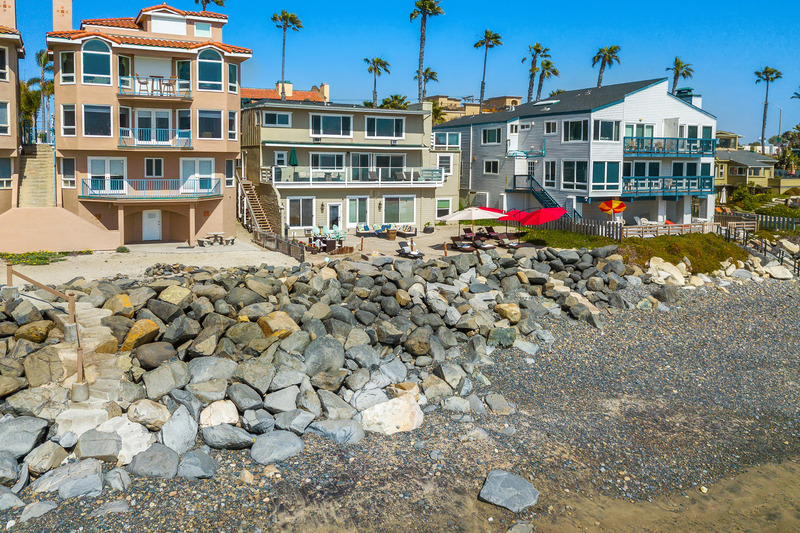 Private beach with soft sand right out your back door. Morning light was gorgeous. Fun to watch the surfers. It appears to be a great spot to ride the waves and we were entertained all day watching surfers and even a couple of dolphins catch the waves. Management company was top rate with meeting our needs. We will for sure come again. It was magical. Note that this place only has one bathroom. We did not find this to be a problem. It is priced competitively, probably because of that, and we thought it was a good value. 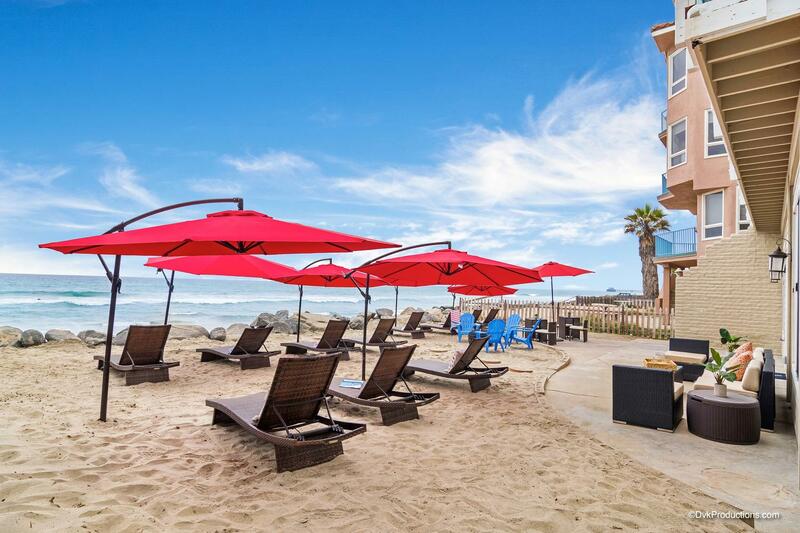 Its a splurge to stay beachfront, but if you are going with family to stay and enjoy the beach we thought it was well worth it. Perfect house ON the beach!!! We rented unit 2 and 3 for a family vacation and it was the best trip we have had in a long time. The house was perfect and they thought of everything. The location was fantastic and it is like you have your own private beach. We had a wonderful 3 days!! This was my 3rd time with beach front only....and I never have a reason to complain! Customer service is always top notch....and will be back very soon! Thank you! Wonderful family fun. This is our second time renting this unit. We live the location and pet friendly. And you are on the beach. We had to call for assistance since my hubby could not get the football game and they came out to fix. All the kitchen pots and pans where brand new. This place has everything. We played board games, football and listened to the waves. This 2br was very spacious, well equiped including washer and dryer in unit. Great patio area for children to safely play in while we prepared lunch inside. Everything was very clean, enjoyed the awesome window views of ocean and dolphins, as well as swimming and surfing in front of unit each day. Close to pier, dining, and shopping. You will definitely enjoy your stay here. stayed here over spring break and LOVED it, this is the second time I have used this company for beach rentals, and I have to say everything they advertise is very accurate!! Im already planning summer vacation here!!! Had a great stay in Oceanside. The rental location was perfect, walk out front door straight to great beach. It was clean and ready when we arrived. There was 7 adults, and it had plenty of room too sleep and move around. Definitely plan on staying there again. I highly recommend. 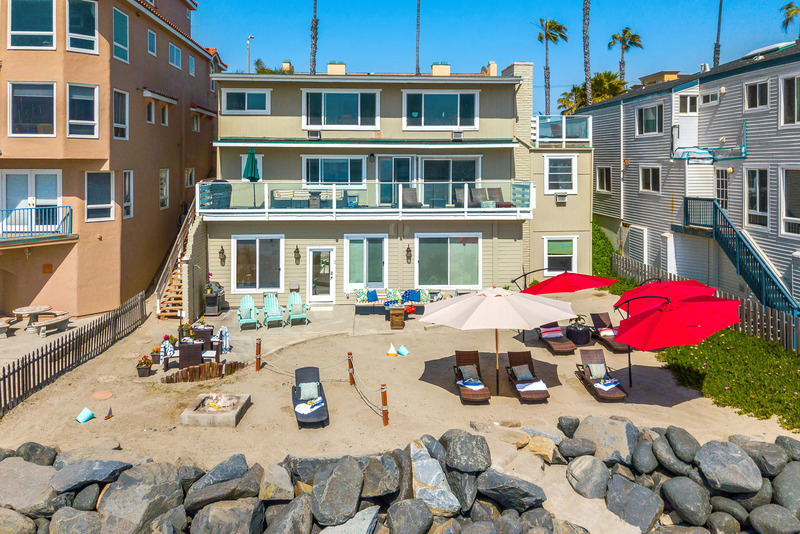 We had such an amazing time staying right on the beach in this beautiful home! We rented the downstairs unit and had our own section of the private beach. From check in to check out the entire process was so smooth. All of the information you need to check in and for your entire stay is provided on the "Glad to have you" App. The staff was wonderful! I couldn't have had a better time watching my mother and her grandsons enjoy the ocean and play in the water, right outside of our door! New owner did a great job refurbishing and enlarging the apartments. We stayed in the second floor apartment last year and had a great experience. This year we stayed in the bottom floor apartment which lacked privacy and a view of the ocean. The new owner put out lounge chairs and umbrellas directly in front of the bottom floor apartment which were used by the other guests. Not a good idea. This Review applies to all 3 units (P5131-1, P5131-2 and P5131-3) that we rented from Beachfront Only Vacation Rentals during the week of Thanksgiving, 2016. All 3 units were clean, well-organized and adequately stocked. Outdoor areas/porches were neatly arranged and fully functional. The 5 (five) parking spaces that were provided for our vehicles was more than adequate. 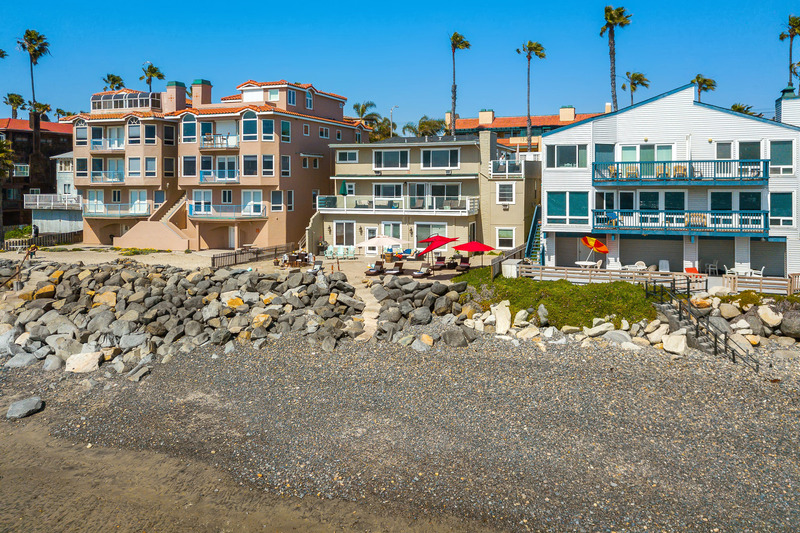 Location on the beachfront provided a semi-private area for our family of 13. This rental facility was an excellent venue for our children and grandchildren. We celebrated my mom's 95th birthday at an amazing Oceanside beachfront house, and she was ecstatic. Everything was beautifully appointed, luxurious, sparkling clean, and very comfortable. We woke to high tides and surfers catching the first waves of the day. Gulls and pelicans flew by. Occasionally we saw dolphins. As evening drew near we walked slowly along the beach, looking for shells and good skipping stones. Every day brought a sunset more beautiful than the last. Great restaurants are close by, but we usually ate at home. Everything we needed was there, including lots of room for dinner guests. After everyone left we'd sit by the fire and talk about the old days. Take a last peek at a million stars out over the ocean, say good night, and fall asleep to the lullabye of the sea. These memories are precious to our family. Thanks for providing an ideal backdrop for the event! All there was a warm appreciation received from our 8 year old saying thanks for giving us a wonderful weekend experience. It's new property expected to have a new facility, don't have to worry of anything to bring for any household use. Equipped with gas grill. Just firewoods and smores sticks. Besides 7 minutes away from Walmart, Costco and restaurants. The unit was clean and beautiful. The kitchen is updated and stocked with everything you need for daily cooking to BBQing. The beach front is right there. Great views! Gas firepit and outside sofa was great for watching the sunset and rise. We enjoyed a couple of nights at this beautiful beach front condo. It was a perfect getaway with some friends and kids. Our 1st floor unit was perfect with the little kids. We will be returning for sure! My husband, son and I had a wonderful time. What a great place! Very spacious and clean. To be able to look out all the windows and view the ocean is breathtaking! Oh, and the sound of the waves and the sunsets are amazing. 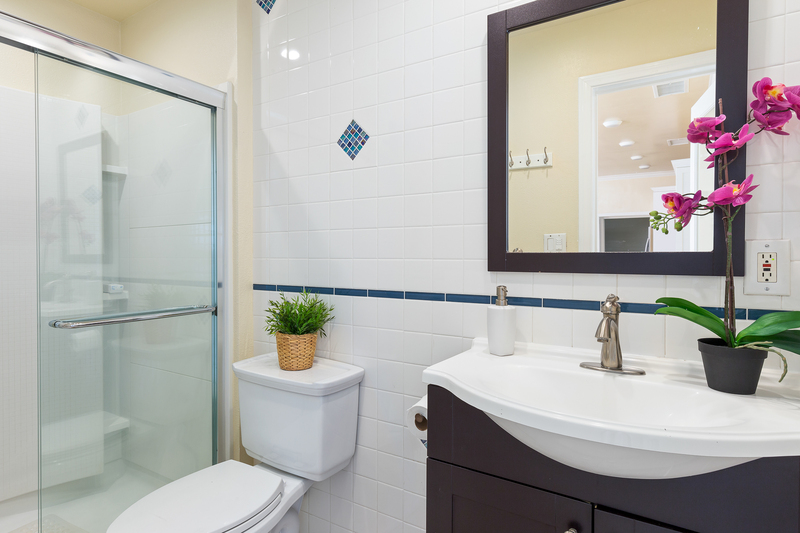 The property was very clean and beautifully decorated. Everything we needed was there. You can't get any better than being able to walk out the front door and step right on to the beach. One of the nights, we got to walk to a fabulous restaurant nearby. Absolutely loved it! Perfect place at the Beach , well cleaned, all things we needed in the kitchen, very well equipped inside and outside,I could live there!!!?????? 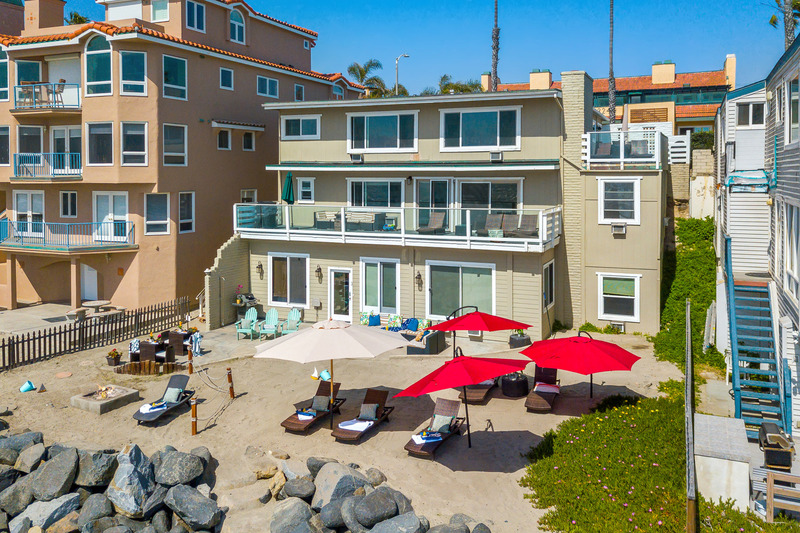 The location is perfect for a relaxing get away- close enough to get to city life but ideal for a quiet and private beach vacation. The views are amazing! Sunsets incredible! 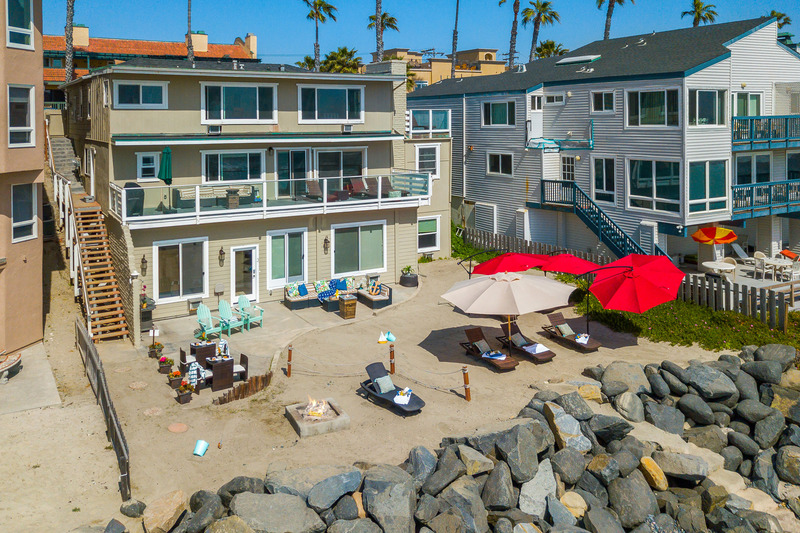 We will be looking to book here again- love unit 3, right on the sand and private patio great for kids or entertaining. 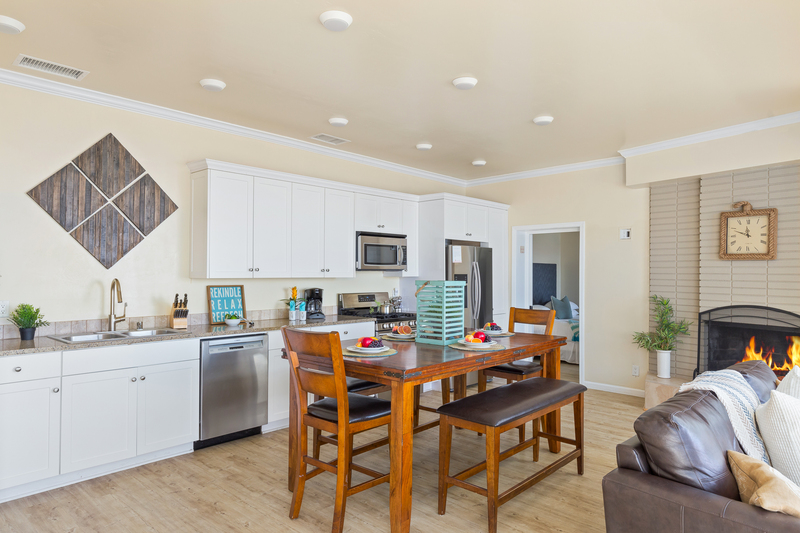 The unit is very nicely laid out and comfortable with up to date amenities. Highly recommend- great for long weekend or extended stay.